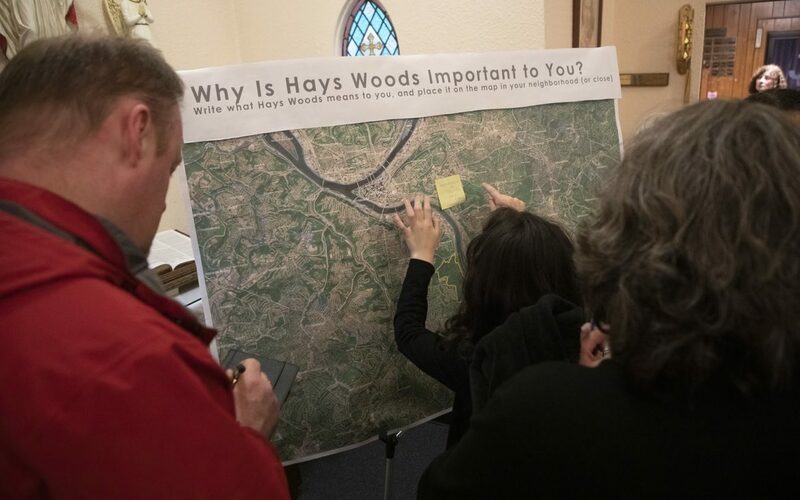 “There will be no housing development in the Hays Woods area,” said Councilman Corey O’Connor at a public presentation of early recommendations made by a 25-member task force. Mayor Bill Peduto created the task force last year to investigate possible uses for the 660-acre site, which could become the city’s largest public park. “So hopefully that saves that question from coming up about 10 or 12 times tonight,” O’Connor, who co-chairs the task force, said to laughter. Once a site of coal mining and gas extraction during the industrial age, much of Hays Woods sat largely unused since the 1930s, save for hikers and other residents who have illicitly entered the land over the years. The area south of the Monongahela River sits in the southeastern corner of the City of Pittsburgh, bordering the Borough of Baldwin. Hays Woods is not open to the public. The URA, which purchased the land in 2016 for $5 million, dedicated the bulk of Hays Woods to the City of Pittsburgh for public use but kept 75 acres for potential development. PublicSource reported in November 2017 about the backlash from local residents concerning development plans. A spokeswoman for the URA said the authority had no comment on O’Connor’s statement that there would be no housing at the site. Preserving and restoring the natural ecology of the woods. Developing transportation options for residents visiting the site, including bus routes, bike infrastructure and a parking lot for cars. An extensive trail system that could accommodate residents with different needs. The URA purchased the site from Pittsburgh Development Group II, a developer group that tried in the 2000s to realize plans for a casino there called Palisades Park. The plan fizzled when the developer could not secure state licenses for the project. The URA had carved out about 75 acres for residential development, something the task force has recommended against in the draft report. Instead, the task force recommends to the mayor and city council that the land be transferred to the city and be part of park plans. The mayor’s office did not immediately return a request for comment Thursday. Nearby residents of Pittsburgh and Baldwin have been haunted by a familiar Pittsburgh-area problem: land subsidence and regularly flooded basements as a result of steep slopes and hills. 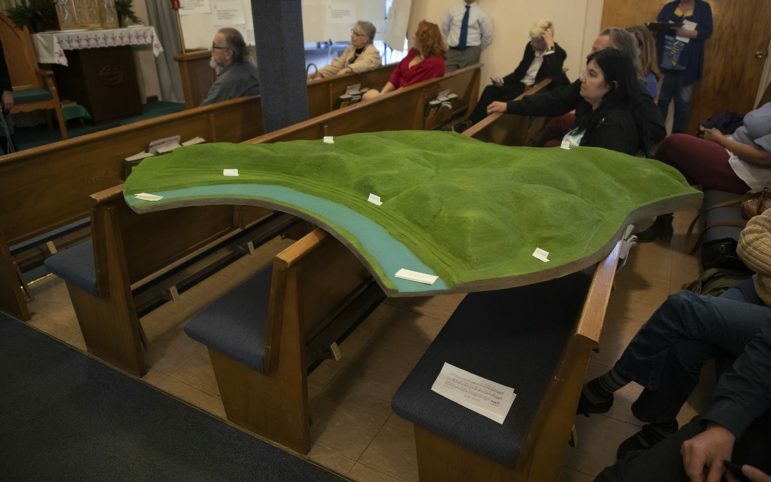 Theresa Ciolli, a longtime resident who lives near Glass Run Road, said a subdivision built on the site of the former Holly Hill Golf Course has exacerbated erosion and stormwater issues for homeowners down the hill. There are other challenges for a park in Hays Woods: the site contains slopes with grades over 25%, and decades of coal mining a century ago have altered the water and soil in Hays Woods. Sean Brady, executive director of Hollow Oak Land Trust, said the task force had done a great job in its initial report, but he worried a decision not to allow deer hunting on the grounds will make adequate forest management in Hays Woods impossible. Brady pointed to Philadelphia as a city in Pennsylvania that has successfully used deer hunting for ecological restoration. It’s unclear how many years it will take to create a park in Hays Woods. City officials said the process will move forward if the project wins a state grant from the Department of Conservation and Natural Resources. That grant would fund the development of a master plan for the site in 2020 and various community meetings would take place as part of that process.